Probably like everyone else, Christmas is a favorite holiday to celebrate. Who doesn't love getting gifts? I am sad that not all Sanrio fans around the world can have access to an official Sanrio store. Here's to a special HK buddy of mine: MERRY CHRISTMAS! ^ Don't you just love Sanrio's gift wrapping paper? I haven't seen any pretty Sanrio gift ribbons, but hopefully I'll find one that I like someday to wrap a present for next year. This Christmas, I have a lot of things to be grateful for. Not only do I have such great Hello Kitty friends, I am lucky to live in a world where I have a warm safe home to come to and most importantly, I have my Sanrio collections. 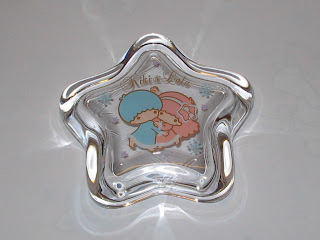 Recently in the mail, I have finally received half of my Little Twin Stars *Romantic* X-mas Glassware. ^ I haven't yet taken my pictures yet, but aren't these two beautiful? 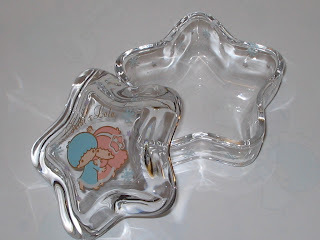 I have the glass plate and small glass container coming in the mail. 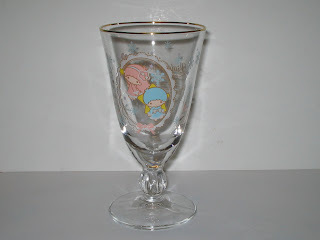 I have another copy of the Champagne/Chalice cup coming to me from Hong Kong, as well as another glass plate. Some might think I'm crazy for wanting more than 2 pieces, but like I mentioned - I'm obsessed! On some of my Angel Hello Kitty Tea set, I have more than 2 copies. To follow up, I intend to have a total of four *Romantic* glass plates and chalice cups. The LTS glass is so cute! Congrats! I can't imagine having the space to store all these things. Yes, looking forward to xmas! Bf said he got a lot of Sanrio stuff for me. We shall see. Keep up the interesting posts. I will write you later :-). -Arista.